Mayberry opened pretty recently on Vine Street, and various bloggers have been making there way in to try Josh Campbell’s newest venture. The result of this, of course, is mouth watering pictures of BLT’s and burgers posted to the interwebs. Couple this with delicious soups that change daily put out into the twitterverse, and it was only a matter of time before David and I met for lunch at Mayberry. The soup of the day on Monday was maple sausage potato. I was not about to pass that up. I called David and asked him to meet me for lunch. Mayberry offers one size of the soup of the day--a big bowl--for $5. It came with a little crunchy cheese bread that I liked. Also, the portion size of the bowl is enormous. Seriously. I had to take half my soup home. The maple sausage was tender and tasty, with cut carrots, potatoes, a little onion and a lot of well roasted garlic. The artwork and the paint on the walls is a little funky—black and white Cincinnati scenes and spirals, which are fun to look at. David got “the burger” ($8.00). It’s a lot of beef, tender and juicy and cooked to order. Onion marmalade and peppered bacon sit atop the patty. Lastly, a poached egg completes the burger, which is then put between a toasty bun. David said the texture of the patty reminded him a little of meatloaf—there was definitely some onion mixed in. We concurred it was indeed a tasty burger. The place is pretty small—Josh mentioned it only had 28 seats, and can get toasty during lunch. Things turned over pretty well, food was prepared quickly and to order, my soup was piping hot in its giant mug. We met Josh, who knew that we were coming. I guess it’s not hard to spot a food blogger, they are usually the diner with their camera an inch away from their food, their spouse pleading “Can I eat now?” while their dinner is meticulously photographed. I asked if I could poke back in the kitchen while I talked to Josh a little. Mayberry has a half partition in the Kitchen, and there is a long narrow hallway that runs beside it. Guests are welcome to come back and take a peek at the various items cooking away. Josh said that the goal of the restaurant was to have good food, at good prices. As I was photographing the biscuits leftover from breakfast, I was given a tantalizing hint of what is to come from Mayberry brunch, which will be served on weekends in a few weeks. The “Elvis Killer”. I won’t give it all away, but let me just say that it involves waffles. And peanuts. I also tried the tater tot casserole ($3), which I found to be very good with the soup. Next time I will try the mac n cheese. David loves the fact that poached eggs are on the menu. In the back of the kitchen, a large pot of water seemed to constantly have eggs poaching in it. The only thing I recommend change with is the drink prices. Little bottles of Coke and Diet Coke at $1.50! That seems a little high. Everything else on the menu is priced extremely reasonably (all of the sandwiches are under $10, with interesting and quality ingredients), and the portions are very generous. Mayberry will open for Dinner on December 4th, and in addition to that, is BYOB until they get a liquor license; so you if you want to bring your favorite beer or wine to have with dinner, that's cool with them. The full menu can be found through Urbanspoon—but be aware it may change based on what is locally available and what’s in season. I know I’ll be back to the Mayberry soon, and we are eager to see what else Josh will come up with! Update: the beverage situation has been resolved--and 20 ounce bottles are now $1.50. For pictures of Mayberry's Sunday brunch, see this Cincinnati Nomerati post. 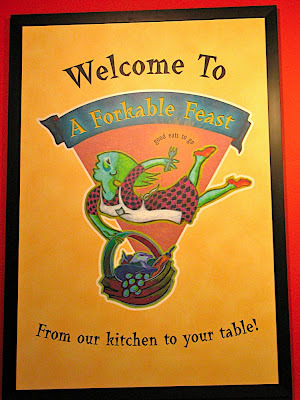 We spotlighted A Forkable Feast for November’s Eastside Eats. I wanted to take the opportunity to review it as well and put some more pictures we took to use. We arrived at the end of the day, and we were lucky enough to meet Stu and Randy, who own the place, and Michael, the head chef. David and I were both impressed at how the food was packaged—sealed in cute oven safe containers— as well as the variety. A major plus is their availability of gluten free cupcakes and desserts—even stuffing! A nice selection of beer and wine is also available to take home. We spied Victory Prima Pils, a nice pilsner, Lambic raspberry, and even a gluten free beer. Stu selects the wines that he thinks will complement a tasty meal. House made pasta and pesto can be purchased and doesn’t take long to cook. We were sent home with some pasta and also the veal ricotta meatballs, which are tender and tasty. David says they are, and I quote: "frickin delicious!" The texture of the pasta was excellent. I've never really had a pasta quite like it. We really enjoyed our visit (and our dinner). I recommend you check out the online menu on their website, and take the night off from cooking if you get the chance. If you had asked me when I was 10 if I would ever live downtown, I would have been taken aback, if not horrified. Live downtown? People actually live downtown? My limited view of the city from living in the suburbs of Loveland included my parents shuttling my brother and I to and from the Aronoff to see my sister in the Nutcracker. To my younger self, downtown was dirty, dark, and scary, with lots of panhandlers. Also, there were pigeons. But after the cat caught his fifth mouse, and our neighbor’s toilet upstairs began leaking through the ceiling, (clean water, our landlord claimed, surely not a big deal) our time in our cheap Clifton hodgepodge of an apartment had come to an end. We moved to East Walnut hills, an outpost of the “Hyde park near” area. On the front lines of the gentrification effort on Woodburn, we did begin to feel a little isolated. We also were down the street from a fire station, which was extremely noisy. But at least we had a dishwasher; and no mice. Downtown still remained a labyrinth of one way streets, shrouded in mystery. I was thrown into the deep end and forced to learn my way around when I got a job downtown close to Third Street. I cautiously explored around the office, in block by block sections. Eventually, I learned my way around, for the most part. I started Cincinnati Nomerati and began reviewing restaurants, including some around my workplace. But live downtown? Nah, that was not in the plan. At least, not until we actually became friends with some downtowners and local bloggers, the 5chw4r7z’s. They are very proud downtowners and adore it. They are very emphatic about how much they love their condo and the location. So when David mentioned maybe moving downtown from our last place to a bigger apartment, I jumped on it. Within three days, I’d found a place and we were close to signing a lease. I know it seems fast—but that’s just how I roll with things I really want to do. I planned our whole wedding in 28 days. So far, we love living downtown. I feel a lot more connected to the city and the many unique, creative and talented bloggers that we’ve become friends with. I’m able to take the skywalk to work and come home at lunch. Kitty and I watch the pigeons out the big windows and the hipsters smoking outside of FB’s. We have a dishwasher and more space, no mice and no fire trucks. It’s been a long journey, both in actual location and in our view of Cincinnati as a city. I can honestly say I feel proud to be a part of it. We’ll see you downtown. Despite a somewhat hectic moving day and the movers dropping a box on my foot, we’re finally getting settled in at our new apartment. Last Friday we walked over for cocktails and dinner at the newly re-opened Hamburger Mary’s. Happy hour makes most of the cocktails made with well liquor $5, and they have an assortment of lawnmower beers—Hudy Delight, PBR, and Burger Classic for $1. The inside of the place is fairly large, with two bars—one larger and in the middle of a dance floor to the right of the entrance, and a smaller bar is right by the door. On the left is the dining room, which has lots of bright colors and space. I started with a “raspberrita”. It’s exactly what it sounds like, a raspberry margarita. 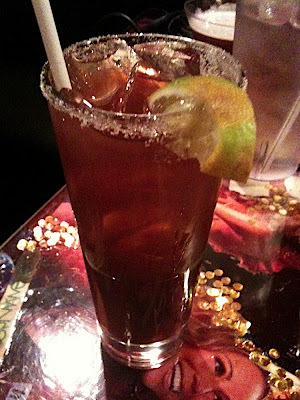 The bartender must have read my mind, because it has sugar, not salt, around the rim. It was pretty good, but also very sugary. David decided to get not one, or two, but the whole ménage a trois of the $1 beers. Yes, I tried to talk him out of it. I pointed out that HM has Dogfish 60 and 90 minute in bottles. It didn’t work. Our group did insist he drink them with his pinky out. See, this is why you should listen to your wife. I got another cocktail, the “pop your cherry tini” made with red cream soda. It was good, though also very, very fruity and sweet. My friend Janelle got a cocktail made with champagne and red bull, the "Chambull", she liked it a lot. For food, Janelle and I chose appetizers. She got the nachos. Lots of toppings, lots of cheese. Can’t go wrong there. David ordered his second beer. I chose to get the Mary’s Handbag ($13), a sampling of most of their appetizers, and the mini Mary—a mini burger with cheese. ($2) I was a bit surprised when they asked how I wanted it cooked—is it even possible to get anything other than a well done mini burger? I didn’t think so. I was right. Regardless, it was delicious. Everything on the Mary’s handbag is fried. Chicken tenders, onion rings, wings, calamari, and fried macaroni and cheese. There were a few little pieces of iceberg lettuce on there—which David and I both found funny in juxtaposition with the rest of the plate's contents. The fried macaroni and cheese is very tasty, and it was probably my favorite appetizer. The calamari was not too chewy, and I really liked the marinara sauce that was served for dipping. David ordered his last beer, Burger classic. David says: "They tried to add some flavor..."
"but I'm not sure it went to a good place." While the Burger classic may not have gone over well, the actual burger, with mushroom and sweet potato fries, did. My last drink the Mary’s punch, which I couldn’t finish. This was the drink I liked the least—it was incredibly sugary and tasted a little like grape Dimetapp. The checks come inside shoes, which our server chose based on what she thought we would like. Janelle got a silver one with glitter. It was a good match. We dropped David back off at the apartment and Janelle and I ended up going back to Hamburger Mary's to dance later. We had a good time, though there was a some sort of reservation mix up--some sort of reservation for two booths for a private party had been booked earlier, and their DJ went rogue and attempted to kick everyone out of the entire bar. I'm sure you can imagine that did not go over well, but the manager was quick to correct the problem and was very apologetic about it--even showing us the actual contract-- when I asked her to explain. Despite the snafu at the end of the night, we enjoyed our dinner and will definitely be back for Mary-oke on the days that it's held. The staff was friendly and courteous the whole night. I might get a whole plate of mini-Mary's with cheese!